We had a French exchange student staying with us for a couple of weeks, Sophie. Turns out she’s applying to film schools, wants to learn the ropes, start as a cameraperson and work her way up to directing. She’s well-versed in American film, a great admirer of Wes Anderson (and took advantage of the opportunity to watch The Grand Budapest Hotel, which is still playing at the local art house), but arrived knowing next to nothing about the classics of her own country’s cinematic tradition. I had my work cut out for me. She’d heard of the New Wave, of course, but had never seen Breathless or The 400 Blows. We remedied that—and Jean-Paul Belmondo gained another admirer. She’d never heard of Chris Marker, but I’ll bet she’s going to knock the socks off the interview committee with her insights into La jetée and Si j’avais quatre dromadaires, which we happened to catch at the Massachusetts Multicultural Film Festival before she left. And the crowning touch, my favorite French film of all time: Jean Renoir’s 1939 masterpiece, The Rules of the Game. Yes, I know it’s everybody’s favorite. Long before Downton Abbey, here was an upstairs/downstairs-y story, complete with frocks and motorcars, that didn’t indulge in nostalgia for a lifestyle that was soon to be destroyed. Renoir couldn’t wait to see this world end. It was dead already, as he shows us here. That’s him in the bear suit, by the way. When he asks the amorous couple to help him out of it, the gentleman responds, “On n’a pas de temps.” We have no time. Renoir’s character repeats the line, just to make sure we get it. In a film whose shots often run for a minute or more, here fifty-one shots appear in less than four minutes, in a mounting rhythm of cutting and movement that culminates in an awesome barrage of gunfire as, in twenty-two shots—fifty-three seconds—twelve animals die. This makes The Rules of the Game sound gruesome, but it’s actually an enchanting film. 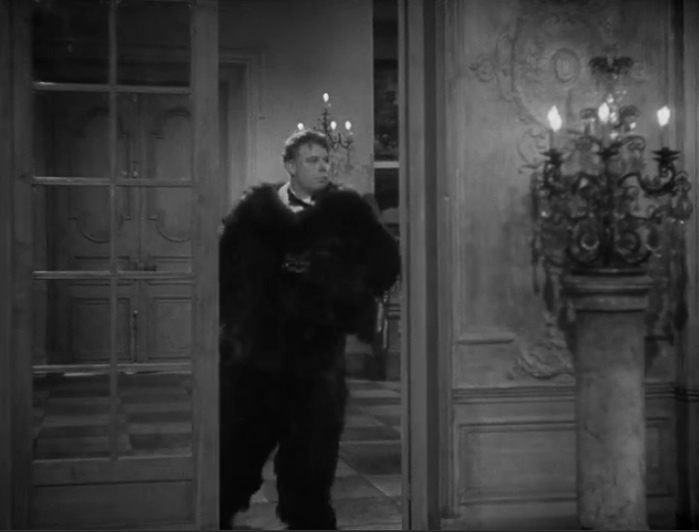 Renoir’s affection for his characters comes through in every scene. Flawed human beings dancing on the edge of a volcano (as he put it). You feel sorry for each and every one of them. And Sophie? I came home the next day and found her watching it again, along with all the supplemental materials on the Criterion disc. Do you know what Criterion’s supplemental materials consist of? I think I’ve viewed Criterion’s version of the film and saw that stuff, but I’m not sure. I certainly remember the film, though I can always stand to watch it again. Here’s the link to the Criterion page for Rules of the Game, where you can also read the essay I referred to above and watch the trailer. Watching it again almost made me cry, it was so wonderful.